Yesterday was the last business day for elBulli, a widely heralded 3-star Michelin restaurant located in Catalonia, Spain. Helmed by global celebrity chef Ferran Adrià since 1987, the restaurant has received a record number of awards by Restaurant Magazine as "The World's Best Restaurant," featured atop its Top 50 list five times in the past decade. So what prompted the close? According to Adrià, the overwhelming popularity (over 2 million requests per year) wasn't conducive to creativity in the kitchen. The cost of maintaining a large staff also factored into the decision. Often there were more chefs preparing the meals than there were diners eating them, despite each dinner's $385 price tag. "We created a monster and it was time to find a way to tame it," Adrià said. elBulli's final menu was a glamorous production of 50 courses beginning with a dry "martini," a spherical globule of reconstituted olive followed by a spritz of atomized gin and vermouth on the tongue. Other courses on last night's menu include: pistachio ravioli with "mimetic" peanuts (peanut cream with a hardened skin), mojito and apple baguettes, liquid croquetas, Gorgonzola ice cream "balloons," clam meringue, ham and ginger canapés, olive oil chips, and Parmesan frozen air -- a signature dish at elBulli that arrives in a Styrofoam container. To experience it, diners first sprinkle a small mixture of muesli inside. There is a silver lining to the restaurant's closing, however. 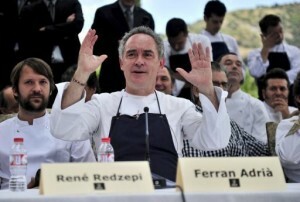 Adrià announced his plans to reopen and add on to the building in 2014 via The elBullifoundation. The organization will be a central hub for culinary creativity and invention, and will also grant one-year scholarships for chefs to come and work at the facility. "It would be logical for this to be a very sad day, but it is the opposite," said Adrià moments before serving his final menu. "We are happy, very happy, because the project will continue."